In case you missed it, Condi's Euro-tour was a complete flop. Far from being the “triumph” celebrated by FOX News, the trip was just another opportunity to parrot the belligerent policies of the Bush Administration to our former allies. 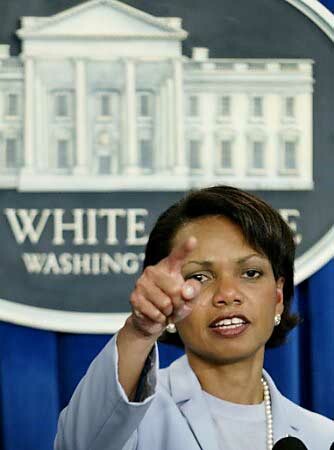 Unlike her predecessor, Rice never deviates from the White House script she has painstakingly memorized. Powell, however lacking in candor, was known to diverge from the hard-right fanaticism of his superiors from time to time. That will never be said of Condi, who flatly refuses to engage in any impromptu conversation that might take her off message. The press coverage was nearly as abysmal as her lackluster diplomatic performance. Of the 1,200 or more articles entered on Google, at least half of them use the term “fence mending” to describe her trip. It's clear that the media had decided on a strategy for their coverage long before Rice had left Washington. The stories invariably shower praise on the Ice Princess for her magnanimous gesture of reconciliation. In fact, Rice has simply mastered the art of giving directives through a frigid grin. There was no sign of compromise whatsoever. The real purpose of the trip was to enlist more support for the occupation in Iraq and to prepare the Euro-leaders for war in Iran. Now that the elections are over, the Bush administration is free to divide up Iraq's oil wealth among competing oil companies. Condi's excursion is meant to coincide with the issuing of leases to those lucky Lotto winners whose countries are willing to get on board the Bush gravy train. This is precisely the scenario that the neocons anticipated before the war when they said that after the conflict “others would follow our leadership.” The energy-dependent Europeans now have to figure out how to gracefully manufacture a reason for involvement without upsetting public opinion. The massive media campaign aimed at showing "thawing relations" between the US and Europe is designed with that very purpose in mind. Even anti war activists could potentially be persuaded by a strategy that promises greater security for the Iraqi people. Regrettably, Iraq's resources will continue to be plundered regardless of whatever aid is provided by Europe. In any event, cunning European politicians are not duped by Condi's charm offensive or by the glowing press reports. They have the tough assignment of measuring America's inducements to join the colonial adventure against their moral qualms about supporting aggression. Their final determination will depend to great extent on how well the tsunami of anti American sentiment in their own countries can be successfully controlled. Nothing is certain, but we should expect to see greater incremental involvement in the occupation behind the mask of stabilizing the region. Iran, of course, is a much thornier issue. The Bush administration has telegraphed its intentions to invade Iran regardless of public opinion or the will of the international community. Rice's trip only confirms what we already know from reports of fly-overs, covert operations and a long written record of plans to put the resources in the Caspian region under the American control. Once again, the US is trying to disguise its unilateralism behind the skirts of the UN. The motive, however, could not be clearer. When Rice says that the present situation “cannot go on forever,” we should expect an attack within the year. The fact that Iran has complied with its treaty obligations under the NPT (Nonproliferation Treaty) and willingly undergone extensive inspections by the IAEA (International Atomic Energy Agency) makes no difference. Even the allegations of a nuclear weapons program are nothing more than a pretext for initiating hostilities. America is going to war again and Europe had better prepare itself. Condi's Euro-journey informs us of how the State Dept will function in the future. Rice will provide a carefully worded digest of administration policy, and the media will convey the message in language aimed at managing public perceptions. One hand washes the other. In truth, the State Dept is nothing more than an annex of the War Dept, which is now under the guidance of industry's chief ambassador, Don Rumsfeld. Condi may be an effective spear-carrier for the empire, but there's no doubt about who's running the show. When foreign policy experts analyze the Rice junket, they'll see it was just more war-mongering belligerence dolled up in a lacquered helmet and toothy grin. Condi came with ultimatums not friendship. Her shabby attempts at civility and compromise are just part of the latest White House subterfuge. Behind the empty words and starched smile, the same menacing forces are at play; trying to dragoon Europe into the Iraqi quagmire and edging the US closer to a region-wide conflagration. Condi's feeble attempts at rapprochement will amount to nothing. The Transatlantic Alliance is in tatters and won't be stitched together with Rice's flaccid bromides.